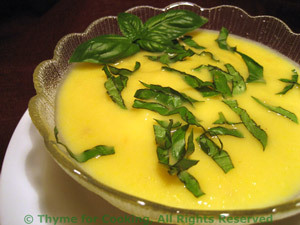 Summer Squash Soup, Thyme for Cooking healthy gourmet recipes. Chop onion, squash and tomato. In a medium saucepan heat the chicken stock, onion, tomato and squash. Cover and simmer until squash. is tender, about 15 minutes. Serve, either hot or cold, garnished with basil.